In recent news pertaining to Coca Cola vending machines, Coca Cola has launched a court case with its ex-vending machine partner. The soft drink corporation started the court battle in bid to retrieve $1million in fees which USA Technologies Inc. collected from Coke vending machines on its behalf. USA Technologies Inc. enables machines to take payment using credit and debit card. 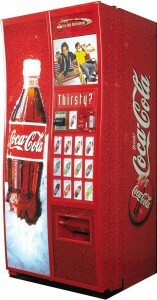 The spat centres around Coca Cola Refreshments claiming that USA Technologies Inc. failed to disconnect its card reading devices on Coke vending machines and carried on taking money from the Coca Cola vending machines despite Coke finishing its working partnership with the company. However, USA Technologies Inc, fiercely denies these claims, saying that there is no substance to the allegations at all and is adamant that it will fight the claims vehemently. It is unknown how many Coke vending machines were fitted with the readers but Coca Cola Refreshments is replacing thousands of its machines with debit and credit card readers built in. In fact, the beverage giant is installing such devices into tens of thousands of its hundreds of thousands of machines worldwide. As part of the original agreement, USA Technologies Inc. received 5 per cent of a vending machine’s monthly income for processing the transactions made by the Coke vending machine.